In a large bowl, whisk together the turmeric, cayenne, 1 teaspoon salt and 3 tablespoons oil. Gently, drop in the cubes of paneer and gently toss, taking care not to break the cubes if you're using the homemade kind. Let the cubes marinate while you get the rest of your ingredients together and prepped. Thaw the spinach in the microwave in a microwave-safe dish, 5 minutes on high. Chop it up very finely with your knife. Place a large nonstick skillet over medium heat, and add the paneer as the pan warms. In a couple of minutes give the pan a toss; each piece of paneer should be browned on one side. Fry another minute or so, and then remove the paneer from the pan onto a plate. Add the remaining 1 1/2 tablespoons oil to the pan. Add the onions, ginger, garlic and chile. Saute the mixture until it's brown, which should take about 15 minutes. Don't skip this step. If you feel like the mixture is drying out and burning, add a couple of tablespoons of water. Add the garam masala, coriander and cumin. If you haven't already, sprinkle a little water to keep the spices from burning. Cook, stirring often, until the raw scent of the spices cook out, 3 to 5 minutes. Add the spinach and stir well, incorporating the spiced onion mixture into the spinach. Add a little salt and 1/2 cup of water, stir, and cook about 5 minutes with the lid off. Turn the heat off. Add the yogurt, a little at a time to keep it from curdling. 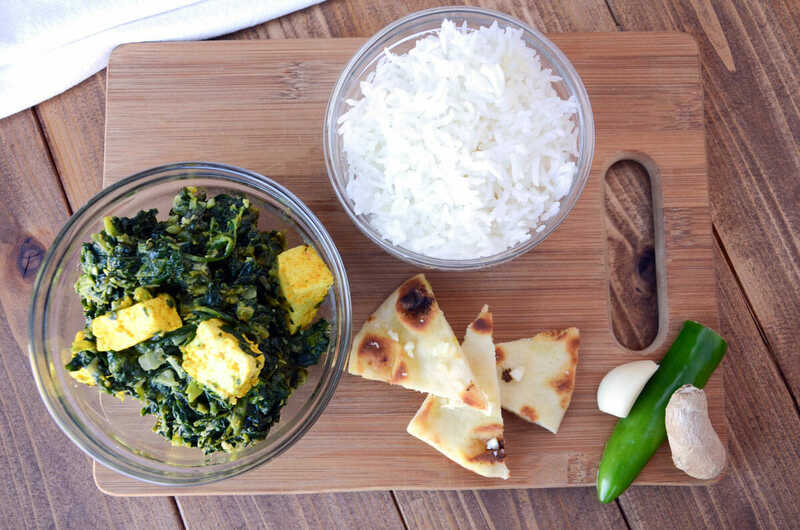 Once the yogurt is well mixed into the spinach, add the paneer, gently so that it does not break up. Turn the heat back on, cover and cook until everything is warmed through, about 5 minutes. Serve along or over steamed basmati rice. In a large wide pot, bring the milk to a gentle boil over medium heat, stirring frequently to avoid burning the bottom. This may take a little while. Remove the pot from the heat and carefully pour the contents into the cheesecloth-lined colander. Twisting the ball to compact the cheese into a block, place it on a plate with the twisted part of the cheesecloth on the side and set another plate on top. Weigh the second plate down with cans of beans or a heavy pot. Move to the refrigerator and let it sit about 20 minutes.